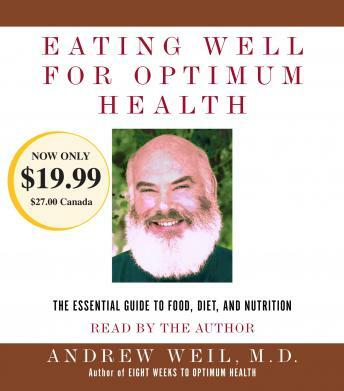 Written By: Andrew Weil, M.D. Narrated By: Andrew Weil, M.D. From one of our most trusted authorities on health and alternative health care, a comprehensive and reassuring audio about food, diet, and nutrition. Building on the scientific and philosophical underpinnings of his enormous bestseller Spontaneous Healing and presenting the kind of practical information that informed his 8 Weeks to Optimum Health, Dr. Weil now provides us with a program for improving our well-being by making informed choices about how and what we eat. He explains the safest and most effective ways to lose weight; how diet can affect energy and sleep; how foods can exacerbate or minimize specific physical problems; how much fat to include in our diet; what nutrients are in which foods, and much, much more. He makes clear that an optimal diet will both supply the basic needs of the body and fortify the body's defenses and mechanisms of healing. Eating Well for Optimum Health stands to change - for the better and the healthier - our most fundamental ideas about eating.